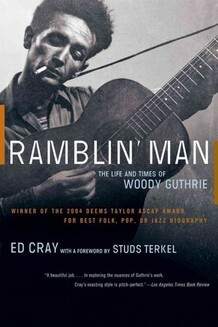 Folk singer Woody Guthrie’s memory is being honored in 2012, marking his 100th birthday. Guthrie has a Northwest connection. In 1941 the balladeer drove his Pontiac from New York to Oregon so he could write songs of praise for the dams. He completed 26 songs in 30 days, including Roll on Columbia, Roll on, which celebrates the river so critical to tribal life. The song champions the dams built under Franklin D. Roosevelt’s administration. The Bonneville Dam, completed in 1938, harnessed the Columbia River, bringing electricity to residents in Oregon and Washington. And it forever changed the lives of the native people. Traditional fishing sites were forever altered. By some accounts, the salmon runs were as high as 10 to 20 million fish every year at the Columbia. Numbers dwindled to the thousands after the dams were built. Even though tribes and government agencies have added fish ladders and refreshed salmon stock at the Columbia, the presence of the Indian people tends to be forgotten in mainstream media. Here’s an example: a recent story in our local newspaper announced a public lecture by a Pulitzer Prize-winning writer that celebrates the 75th anniversary of the dam. Nothing in the story mentions Indians or tribes. Or take the example of a Fresh Air interview this year with two Guthrie scholars, who chatted with interviewer Terry Gross about the Guthrie-Columbia connection. Guthrie’s sentiments were affected by the migrant workers he encountered, including those in Oregon. “You know, traveling on when he did the Bonneville Power songs up north, Washington and Oregon, you know, a couple years later, you know, again he saw migrant workers and how, you know, how they were living, and it just really kind of affected him. So, you know, he wrote to that,” said archivist Jeff Place. But no one in the interview mentions the Indian communities affected by the dams. Writers, historians, story-keepers—all of us—we’re responsible for keeping alive and present what sometimes gets forgotten or overlooked in Western history, especially when it comes to American Indians. This entry was posted in authenticity, ethics, Indian, journalism, Native Science, salmon, science, science communication, social media and tagged Indigenous Science, native science. Bookmark the permalink.